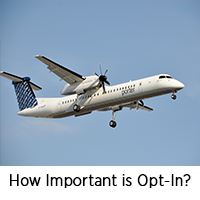 A recent settlement between Porter Airlines Inc. and the Canadian Radio-television and Telecommunications Commission (CRTC) has brought up the discussion about how important it is to include a working ‘unsubscribe’ in marketing messages as well as be able to prove opt-in. The CAN-SPAM Act of 2003 requires that you tell recipients how to opt-out of receiving future email in a clear and conspicuous way. You must also honor the request promptly. Canada’s Anti-Spam Law (CASL) has required the same and has taken it one step further in that you must be able to provide proof of the actual opt-in. Porter allegedly sent emails that did not contain an unsubscribe mechanism. In other instances, the mechanism was not clearly or prominently set out. They also did not honor the requests within 10 business days. In some instances, Porter was unable to provide proof of obtaining consent for the email addressed that received its commercial emails. Porter cooperated with the investigation and immediately took action to correct the issue, but they still agreed to pay $150,000 for the alleged violations. Unlike in the US, Canadians are encouraged to report spam to the Spam Reporting Centre. This ensures the CRTC has enough information to conduct their investigations. This brings to mind whether senders in the US must comply with the more stringent requirements of CASL, or is following CAN-SPAM enough? The simple answer is YES, American senders must comply with CASL. As a best practice, senders should always follow the more stringent of the two unless they are 100% sure they are not sending ANY communications across the border. The problem is that it’s impossible to know where a given recipient is located. With Global ISPs such as Gmail, Yahoo, Outlook, etc., you cannot be 100% certain that you are not sending to a Canadian. Given that Canadians are encouraged to report spam to their government, no sender is safe from investigation — as Porter Airlines found out. Even if you participate in the CRTC investigation but are found to be lacking in the requirements, you may very well find yourself with additional costs and lose those subscribers that don’t meet the criteria. For more information on how you can comply with CASL you can go to WWW.CRTC.GC.CA/ANTISPAM.